Sentiment is a funny thing. What is it about the human condition that makes us attach such fervent significance to even the most mundane of objects? To coin a phrase, when do our possessions begin to possess us? New York Times bestselling author Emily Spivack has a fair idea. 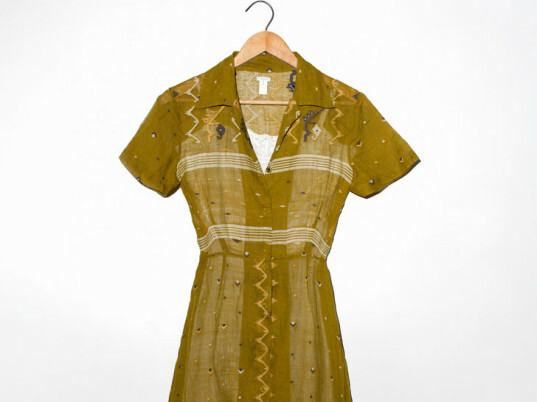 In Worn Stories, Spivack collects more than 60 clothing-inspired narratives—or “memoirs in miniature”—from cultural figures such as Rosanne Cash, John Hodgeman, Simon Doonan, Greta Gerwig, Marcus Samuelsson, Cynthia Rowley, Piper Kerman, and Maira Kalman. 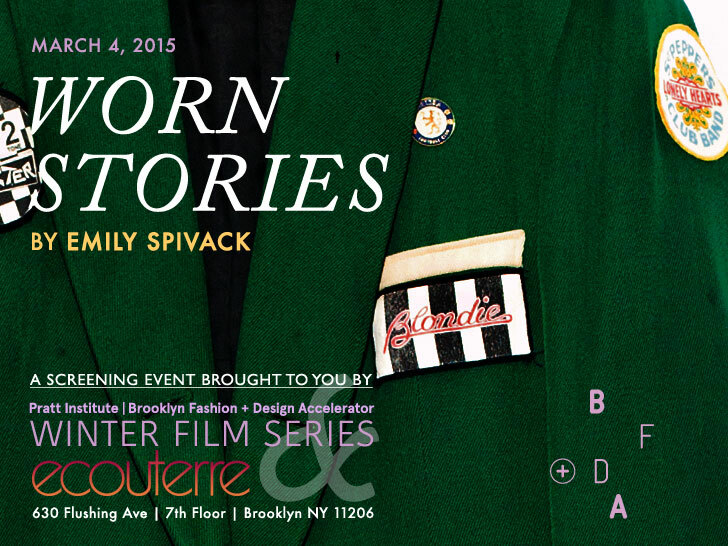 Join Spivack at Pratt Institute’s Brooklyn Fashion + Design Accelerator on Wednesday for a visual tour of the garments that not only adorn and protect us but also serve as touchstones for the narratives we carry inside us. 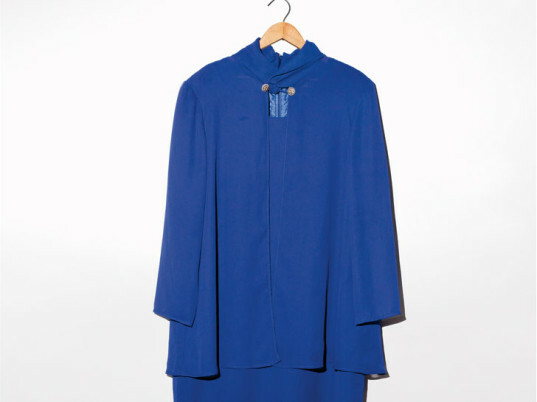 Ecouterre caught up with Spivack, who’s currently a visiting assistant professor at Pratt Institute’s fashion department, to learn more about the “porosity” of clothing, why people hold onto things that have long served their purpose, and the way “fast fashion” is changing the way we consume. 630 Flushing Ave, 7th Flr. $10 suggested donation; includes a book signing, an invitation to record your own sartorial story, and a post-talk clothing swap. What is your elevator pitch for Worn Stories? Worn Stories is a collection of stories that people share with me about a piece of clothing in which something significant or momentous happened to them while they were wearing it. The book itself is a collection of 67 stories, and it’s also [an ongoing] web project. Worn Stories had its genesis online; what was your impetus for that? I always knew that I wanted Worn Stories to be a book, but books can take a really long time, so I started the project as a website to refine the idea, have the opportunity to start collecting stories and put them out into the world, and in the process, figure out how to make a book happen at the same time. It was a great way to get the project started even though I knew that a book was what I ultimately wanted to do. The way I think about a lot of my work is that there’s a concept, and it can manifest itself in a variety of different ways, which could mean a book, or a website, or an exhibition, or a video, or an audio piece. But I did know that I wanted Worn Stories from the get-go to be a book. But I also wanted to collect people’s stories on a website and have people read them that way. When does a piece of clothing become more than a piece of clothing? I think that our clothes become more than a piece of clothing the moment that we put them on and wear them in the world. 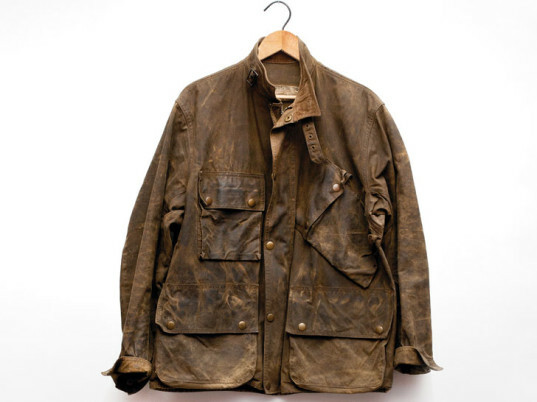 Clothes are porous and they take on experiences, and, as we walk through the world, those experiences get mapped onto the clothing that we wear, whether through general wear and tear, or through stains or holes or rips. Clothes disintegrate and they’re not meant to last forever, but I think clothes become more than clothes the moment that you take the tags off, you put them on, and you’re living and experiencing the world in them. Which stories did you find the most memorable or surprising? Most of these stories I collected, I got on the phone with people or met them in person, and they would share their stories with me. I think the most surprising or memorable parts are just not knowing what someone’s story is going to be, and then having them share it with me; not having any specific expectation and then just be completely surprised by how wonderful the story would be. I love the stories that tie in with a sort of cultural history, a moment of time. But really, I think that they’re all in the book, and they’re all in the book for a reason. I think they’re all significant, and they all tap into different reasons why the project and the stories associated with the clothes are important, whether it’s a significant moment in one’s life, or something to do with a relationship, or a lucky charm, or a clothing mishap—it’s things that are both surprising and unexpected and also highly relatable. Were you surprised by the book’s popularity? It seems to have touched a collective nerve. Yeah! It’s a project that I’ve been working on since 2010—that’s when I started the website. In 2012 was when I knew I was going to be able to make it into a book. So this is just a project that’s just been a labor of love for four, five years, and I just hoped that people would just respond to it. But I also wanted to make something that I could feel proud of and I felt represented what I had hoped the project would and could be. I wanted to collect stories that meant something, and I wanted to make something that I just felt good about. The popularity of the book has just been really exciting to me, and it’s really wonderful to see it having a life out in the world now. The New York Times called your book a “handy antidote to ‘fast fashion. '” Was that your intent? I tell a story in the beginning of the book about going with my students, whom I was teaching at Pratt, to the largest thrift-store distribution center in Brooklyn. What that experience was like for my students—seeing all these garments that almost no longer resembled clothes; they just looked like stuff—and how all the experiences and memories from the people who had worn those things, they had all been lost. They were all gone. I’m not saying that all those stories are worth retelling or worth holding onto, but there was just such a massive quantity of fabric and material that it just became almost unrecognizable. What I’m saying with Worn Stories is let’s pause, let’s be a little bit thoughtful about our purchases, let’s think about why we’re buying stuff and also let’s think about why we hold onto things, and maybe we can recalibrate what it is we wear what we wear. For some people, maybe it is the newest, latest thing. But perhaps for others and perhaps more and more it will shift to wearing that thing because it has a significant memory—something really memorable, momentous happened while they were wearing it or it was passed down from someone who meant something to them. If that’s an indirect outcome of the book then I hope that people will pause and think a little bit about the stories and place a little bit more value on those stories connected to the clothes, maybe the next time they’re just thinking that they have to get another new thing. How is fast fashion changing the way we consume and the way we develop relationships with our clothing? I don’t know if I can make a blanket statement about that. I know that from working on this book I think about what I purchase. I’m much more deliberate about my choices and what I buy and why I’m bringing in new stuff into my apartment. But I don’t know if I’m the audience who’s really buying fast fashion. I just hope, like I said before, that hopefully people will develop some sort of relationship or connection to what they have, and maybe they’ll grow tired of having so much stuff, and so they’ll place more import on things that they have and what they did while wearing those clothes, who they were with, and the memories that are evoked. I say frequently that Worn Stories came out of realizing that clothing is an overlooked storytelling device. I think I’ve been realizing more and more that my closet is this archive of experiences and memories. We have our photographs and recipes, and we also have our clothes that evoke memory. What is the most meaningful item of clothing in your closet right now? There are certainly things in my closet that mean more to me than other things, but I hopefully will be able to winnow my clothing down to things that do have some significance. I’m not saying, when you look at this book, that everything has to be cloyingly sentimental. That’s not what I’ms saying. I think it’s more about the idea of a garment as a snapshot, capturing a moment in time. That could be something that is funny or sad or compelling in one way or another. I look in my closet and I see many examples, so I don’t know if there’s one thing that’s specific right now. What is one thing you’d like your readers to take away? I guess there are a few things. One is that just because the book came out doesn’t meant that the project is over. I am still collecting stories on the website and have opened it up so that people can submit their own stories. There’s a whole section on www.wornstories.com, where people can submit their own stories, called “Your Stories,” and they can write in their story and upload and image, and that winds up on the website. I’m hoping to capture as many stories as I can that way. The other way I’m doing it is with the hashtag #wornstories on Instagram, where people upload a photo and tell their story, and that also winds up on the Worn Stories website. What I really want to do is capture these stories before they disappear. They’re a way to capture our cultural, anthropological history, so I urge readers to share their own stories.